Gluten free living with style and taste! Follow on Instagram @theglutenfreegourmet. I haven’t posted anything here for quite some time now. However, my Instagram account is up to date with, at least, weekly postings – @theglutenfreegourmet – so you can always find the latest food ideas there. Today I’d like to serve you a wonderful “yoghurt”, believe me, you really want to try this. The Pistachio Yoghurt can be served with many vegetables. 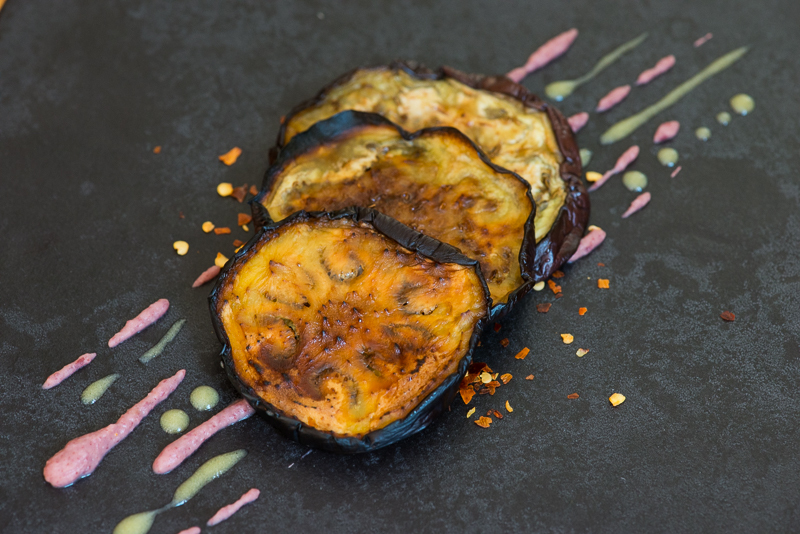 If you don’t want to do the aubergines, try with oven roasted carrots instead. 1. Blend together in a high-speed blender until smooth. Taste and add more salt if needed. Check the texture and add more water if you like. 2. Refrigerate. Should be served cold. 3. Squeeze a ripe pomegranate until soft, cut in half and squeeze over a bowl the let the seeds fall out. 4. 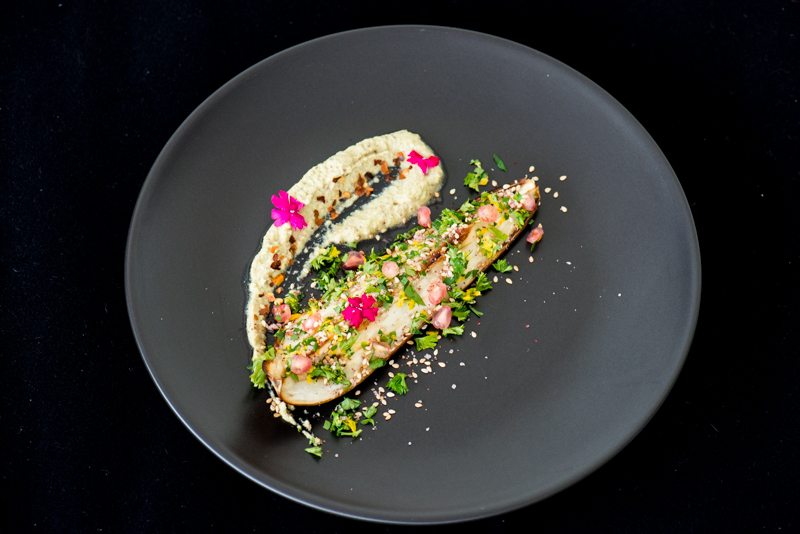 Serve the aubergine with parsley, lemon zest, sesame seed, pomegranate seeds and Himalaya salt on top plus the “yoghurt” with added chili flakes on the side. This is one of my favourite desserts. I keep coming back to it, making small changes and enjoying it even more than before. You’ve probably seen a few different versions of this already on my blog. Make in advance and have on hand in the fridge. 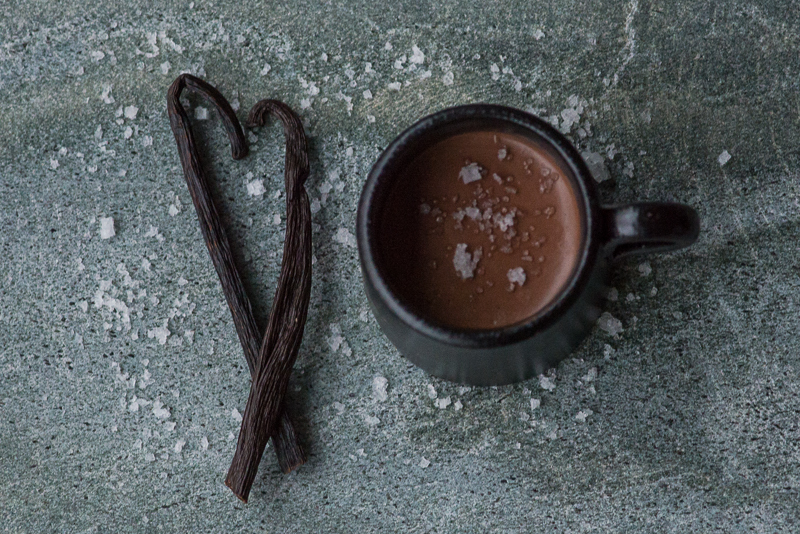 It’s wonderful dessert to be enjoyed in small servings – the perfect ending to dinner. Also, it is a great Low Fodmap, dairy free and vegan dessert. 1. Dissolve the agar agar in a little cold water. 2. Bring the coconut milk to boil. Add the agar agar and let simmer for at least 3 minutes. 3. Add the seeds from the vanilla bean and a dash of salt. Let simmer another minute. 5. Chop the chocolate and add to the milk. Stir until dissolved. 7. Refrigerate 1-2 hours before serving. 8. Serve with some sprinkled coarse salt on top. A really great side dish which actually uses the cauliflower stalks (most recipes use the florets). Sweet, salty and spicy. Delicious! 2. Chop the cauliflower stalks into smaller, bite size pieces. 3. Fry the stalks in olive oil until slightly browned. 4. Mix the miso dressing and add the pan. Gently simmer for a few minutes. 5. When done, take out the stalks and reserve the dressing in the pan. 6. Toss the spinach leaves with some of the dressing. 8. Slice the radish into thin slices. 9. Add the stalks, walnuts and radishes. 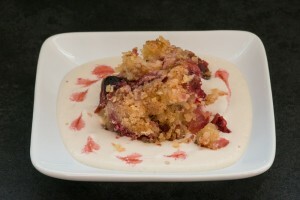 The Plum Pie may not be one of my most healthy recipes, but, oh so tasty!!!! If you prefer, you can use rhubarbs instead of plums. 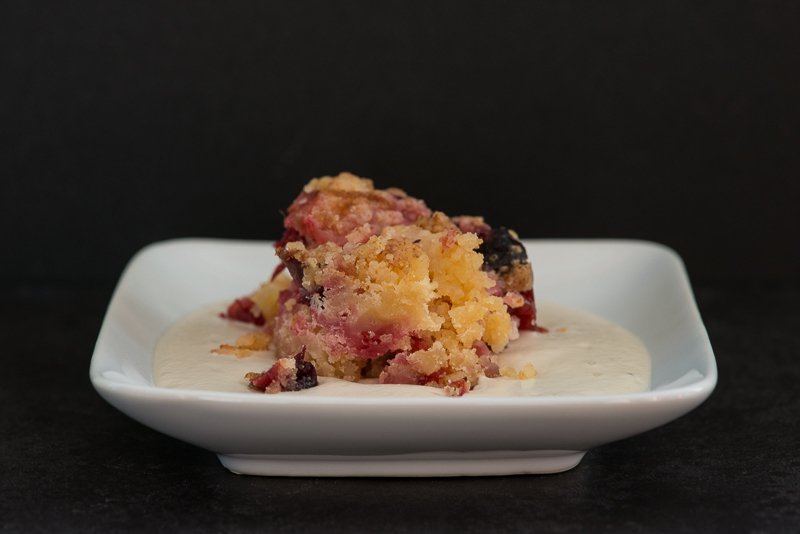 The vanilla sauce is a wonderful dairy free sauce that can be enjoyed on its own, or, with just plain fresh berries. You can use the drops of plum juice (that you most probably will end up with at the bottom of the bowl of cut up plums) and from a small spoon create little juice droplets in the sauce. “Cut through” the droplets with a sharp knife as to create little hearts. See photo below. Baked Root Celery. Minted Pea Puree. Corn Gremolata. A gentle vegetarian meal with a hint of sweetness. If you want more of a bite to it, add some chili flakes to the honey for the root celery. This dish has many components. Feel free to experiment with them in other recipes/combinations. The Beet Shards should be made in advance (may be kept in the freezer). 2. Brush each slice with olive oil and 1/2 tsp of honey. Sprinkle with coarse salt. 3. Bake in 175C oven for 30 minutes. 3. Pour thinly onto sheets and place in dehydrator, 45C, and dry until crisp. Probably overnight. 4. Brake into shards and keep in freezer until use. 1. Pulse in food processor, do not puree, make sure some chunks remain. 1. Run all in blender until smooth. Add the basil and briefly pulse. 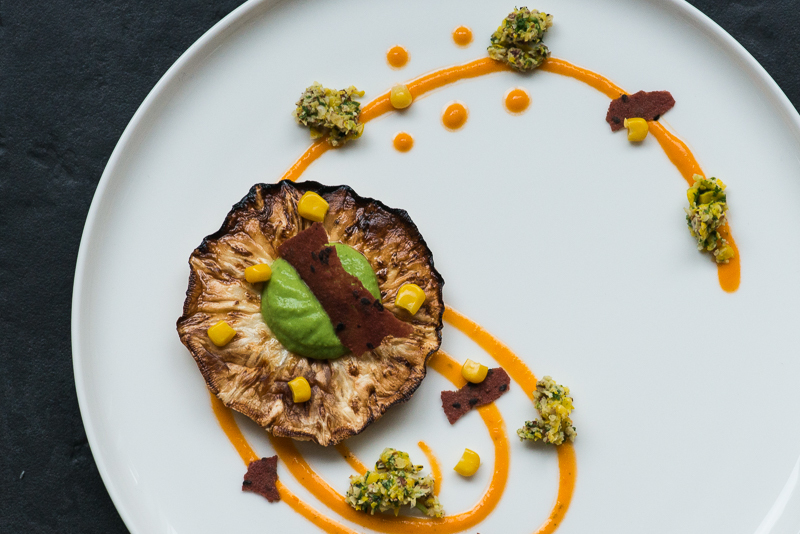 Plate with the tomato liquid, a slice of root celery, the pea puree on top, gremolata, pieces of the beet shards and, maybe, some extra corn. There are some beautiful colours to play with! This starter really has it all; it’s sweet, it’s spicy, it’s sour and it has crunch!! My garden is overflowing with plums so I try to create as many varying dishes with plums as I can. 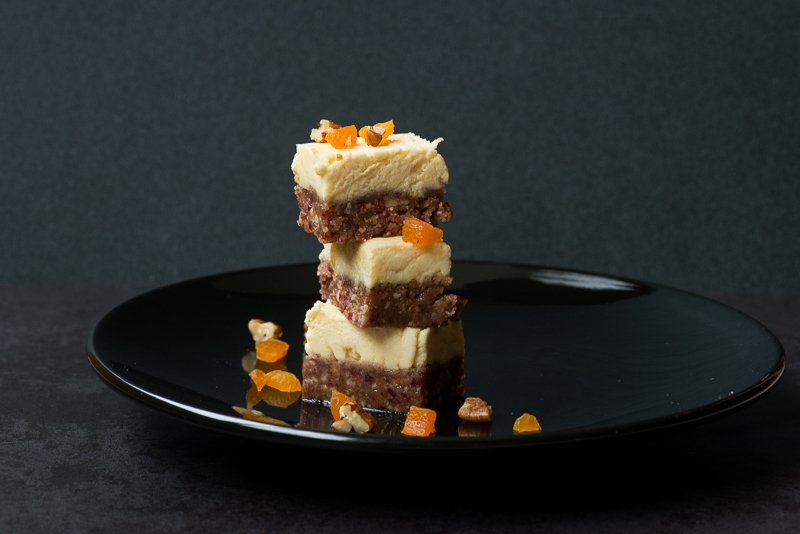 This is a layered sweet potato dish that can be served with or without a spoonful of Greek yoghurt. • Gently fry the plums in the oil. If you, like me, have sweet plums, add the vinegar. If the plums are really sour, add a few drops of agave instead. • Combine all pesto ingredients in a mini prep and run until well combined but still chunky (crunchy). 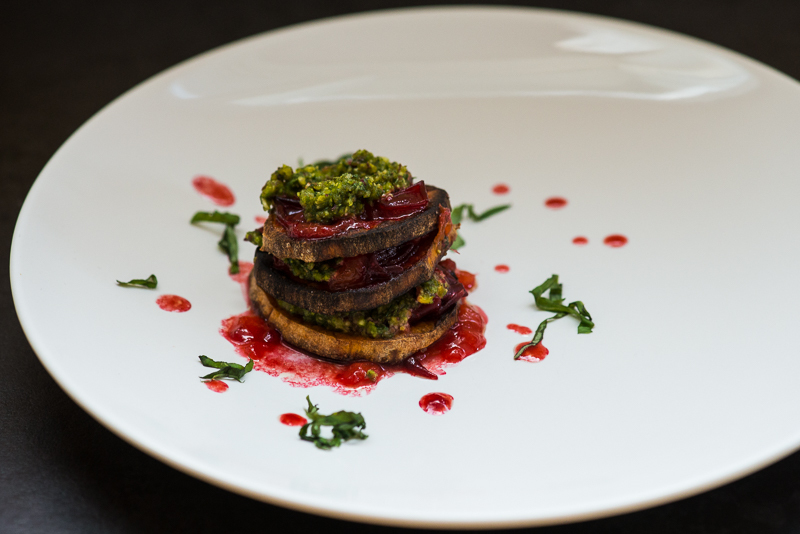 • Start by drizzling some plum mix on the plate, then layer the sweet potato, plum mix and pesto with three layers of each. Decorate the plate with some drops of juice from the plum mix and some basil leaves. Enjoy. Great breakfast or Sunday brunch! A good friend pointed out that my dried, salted, watermelon fruit snack both looked and tasted just like bacon. Combined with the spiced chickpea scramble, the water melon provides a lovely hint of sweetness. But please note, if you want to serve this dish together with the watermelon you need to start the preparations one day ahead. In the dehydrator. It is well worth it!! The pesto is quick and easy to make. 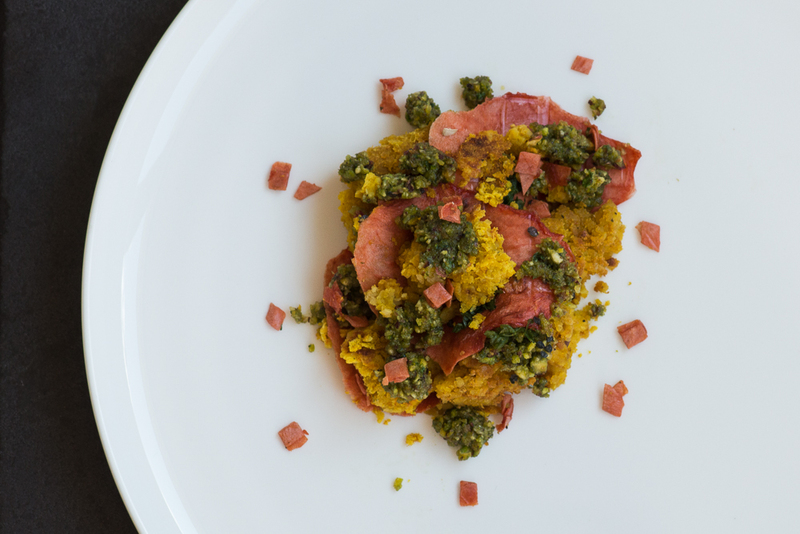 This batch of pest makes more than you really need for this dish but the left-over pesto is nice to store in the fridge and to use with many other meals! 2. Place all ingredients for the pesto in a (mini) food processor. Run for 45 seconds. 3. Place all ingredients for the chickpea scramble in a food processor. Pulse to combine. You still want chunks, not a smooth puree. 4. In a warm sauté pan, spread out the chickpea mix and gently fry in olive oil over medium heat for about 3-4 minutes (it takes a while to achieve a texture that you can actually turn over), turn the scramble and fry another 2-3 minutes until you have some colour. 5. Add in the spinach (to the scramble). Turn a few times and then serve hot with pesto and watermelon. 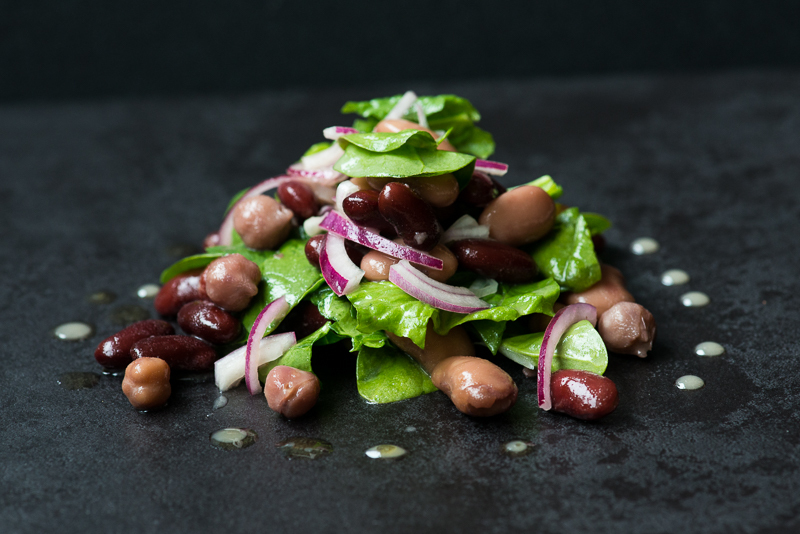 Just a simple salad – but, oh, how lovely! Refreshing, tasty and with a crunch to each bite. Complements anything from the BBQ – how about serving with some grilled halloumi cheese? 2. Shake/whisk the dressing well and toss with the salad. A great dish to go with your BBQ dinner, or just on its own for lunch. So easy – so delicious! 1. Rinse the beans under running water. 2. Place in bowl together with the onion and spinach. 3. Mix mustard, oil and vinegar. 4. Pour mixture on beans. 5. Let sit for a few hours in the fridge for extra flavour. This week is quite busy, but I managed to make a wonderful apricot cream that I would like to share. Spread it on top of the Pecan Base (Raw Food Pecan Pie) which I posted in May (I am repeating the recipe below). Great afternoon snack or guilt free dessert! 1. Blend everything except the apricot until smooth and creamy. (This is a great cream base for other flavors too). 3. Blend again, it is OK to leaves small pieces of the apricot. 1. Place all, except the oil, in a blender and mix until an even, creamy crumble. 2. Add the oil and blend another few minutes. 3. Spread the Pecan Base into a rectangular mold (using baking parchment or other non-stick sheet in the bottom). 4. Spread an equally thick layer of the apricot cream on top. 5. Refrigerate 1 hour minimum. 6. Cut into small, bite sized squares. Red Sauce (not a ketchup). Sometimes, it is good to have some healthy, tasty sauces on hand. I like to make this Kidney Bean sauce which can be used together with so many different things. It’s beautiful pinkish red coloured sauce to plate with (goes especially well with smoked and BBQ dishes). Make ahead and keep in the fridge. Below you will find three other suggested uses. 1. Run in blender until smooth. Taste. Season some more if needed. 2. If too thick add another spoon of olive oil. Consistency should be like a smooth apple sauce. – pour the Red Sauce into a squeezy bottle and place in fridge until time of use. 1. Whisk or shake to combine. Make sure it blends well. 2. This sauce is rather thin, plate with pipette or drop from tip of spoon. 2. Place on baking sheet. Drizzle with salt and oil. Please see my previously posted Crisp Bread recipe. 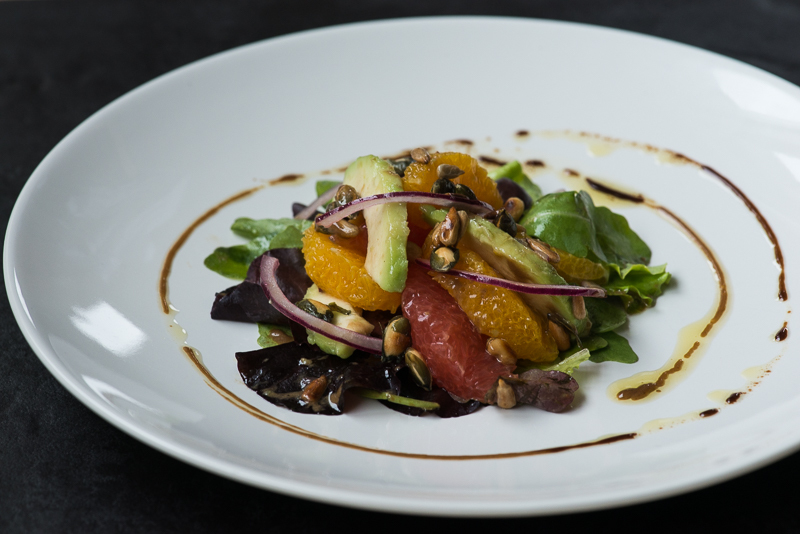 A healthy, tasty and colourful starter! Sometimes, I add a few drops of brandy to the foam (a little goes a very long way) which adds a rounder flavour. Possible a drop of vinegar would have the same effect? Some fresh spinach leaves on the plate to serve on. 2. Toss the carrot slices with juice, oil and salt. Leave for 30 minutes. 1. 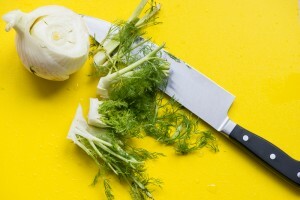 Cut off the tops (including the grassy parts) from the fennel bulb. The bulb can be saved for use another time. 2. Bring some water to boil and blanch the tops for 30 seconds. 3. Remove the tops from the boiling water and put in an ice bath (to secure the green colour). 4. When cool, place in blender with a 2 table spoons of water. Add some more water if needed. You want a smooth, thick mix but do not over blend. 5. Add the syrup, salt and oil. Blend briefly to mix. 7. Mix in the lecithin. 8. Pour the mix into a large shallow container. Using a handheld blender, incorporate air into the mix, thus creating a foam. Might take a few minutes! Spoon off the foam into a separate bowl and repeat until you have a bowl of foam. Serve the carrots with the foam on top. 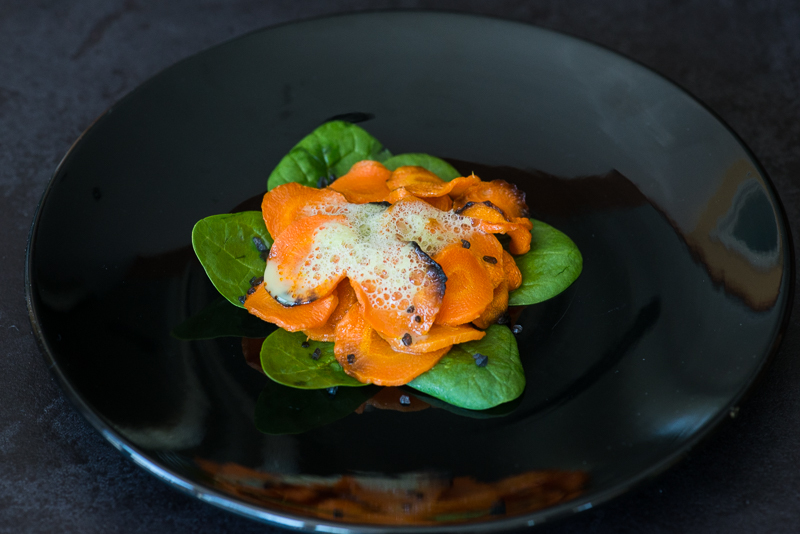 If you’d rather make a fennel cream to go with the carrots, you can either mix in a couple of tablespoons of coconut cream or some double cream. No lecithin. By choosing the coconut cream you will have less of the fennel taste and, instead, some coconut flavour which goes wonderfully with the carrots. 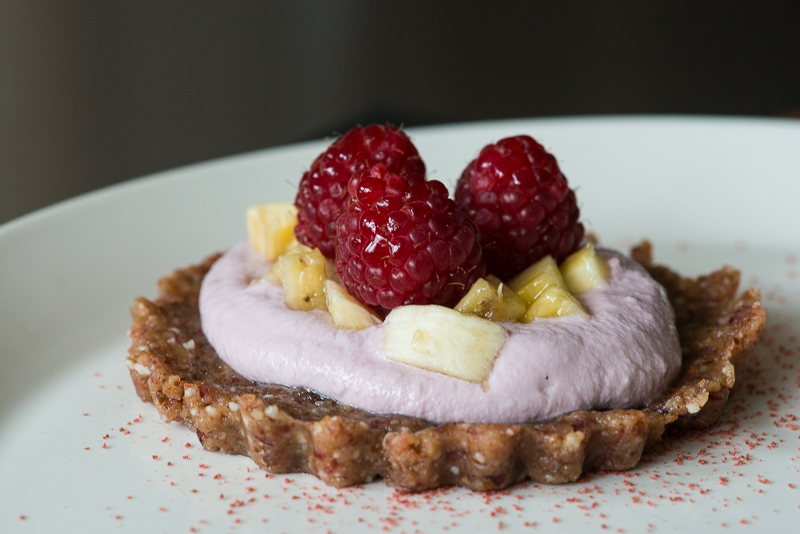 This is a great raw food pie. Easy and delicious. The cashews (for the cashew cream) must be soaked for 12 hours so please don’t forget to place them in water a day in advance. Serve with one of the two creams suggested below and any fresh fruit/berries of your liking! The cashew cream is a favourite with its subtle nutty taste and creamy texture. Please give it a try (a good blender is a must to achieve a smooth cream)! (In this photo I have drizzled dried raspberry on the plate). 3. Press thinly into in portions sized pie molds or free hand rounds. 4. Refrigerate at least 1 hour. 1. Blend all (except the raspberries) until completely smooth. 3. Blend a bit more until desired consistency. 4. Pipe the cream on top of the portion sized pies. 5. Serve with mixed berries on top. 3) Pipe the cream on top of the portion sized pies. 4) Serve with mixed berries on top. 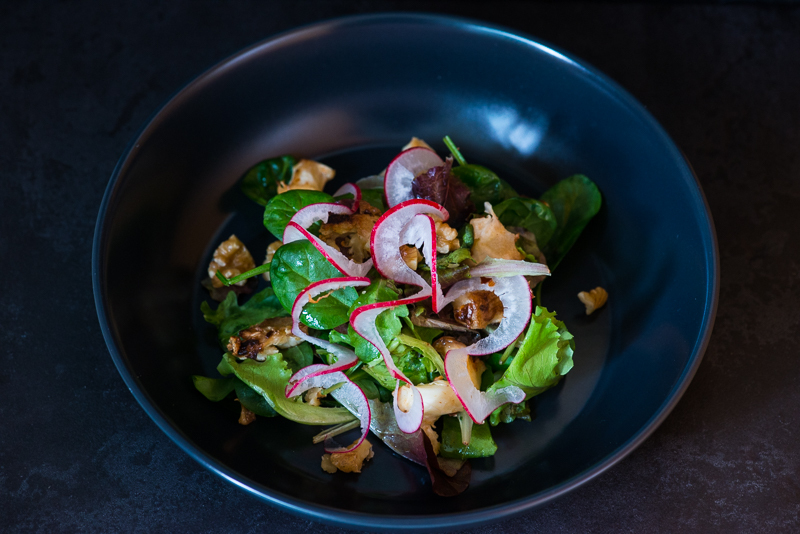 A tasty and fresh spring starter. For a smaller/lighter starter, serve just one cheese ball per person. Toasted pine nuts, chili flakes and the tips of the asparagus. 1) Heat an empty pan on the stove. Add the asparagus and 3-4 tablespoons of water. Cook until all water has evaporated. Add the olive oil. Shake to coat, cover with a lid and take off heat. 2) Run all ingredients for the Pine Nut Cheese except the chili flakes in a food processor until smooth. Stir in the chili flakes. Set aside. 3) Cut of the tips of the asparagus. Set aside. 4) Chop the asparagus stalks into small pieces. Fold the small pieces into the nut cheese. 5) With a small ice cream scoop or a melon baller, make balls of the pine nut cheese mix. 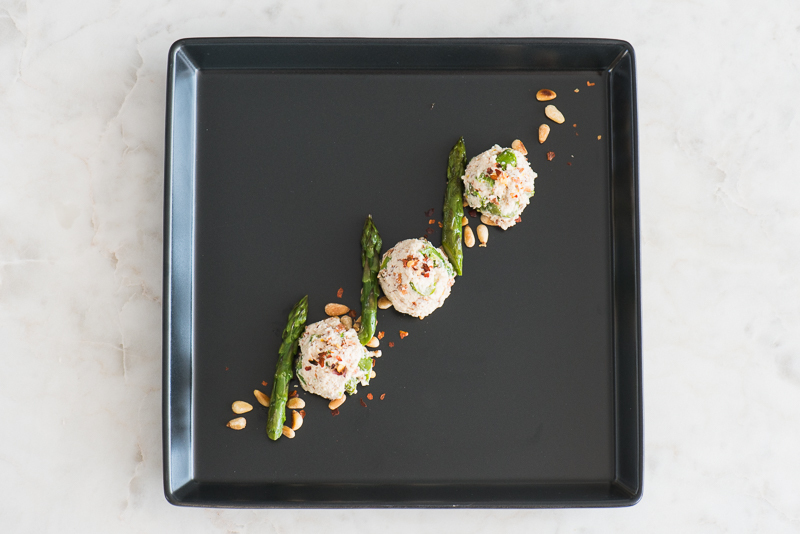 Place 3 balls on a plate, decorate with asparagus tips, pine nuts and chili flakes. 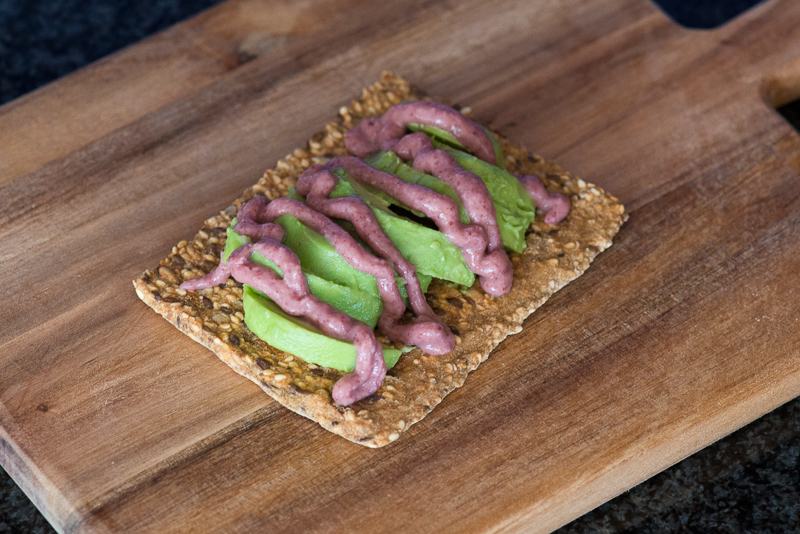 6) Optional – serve with gluten free crackers. 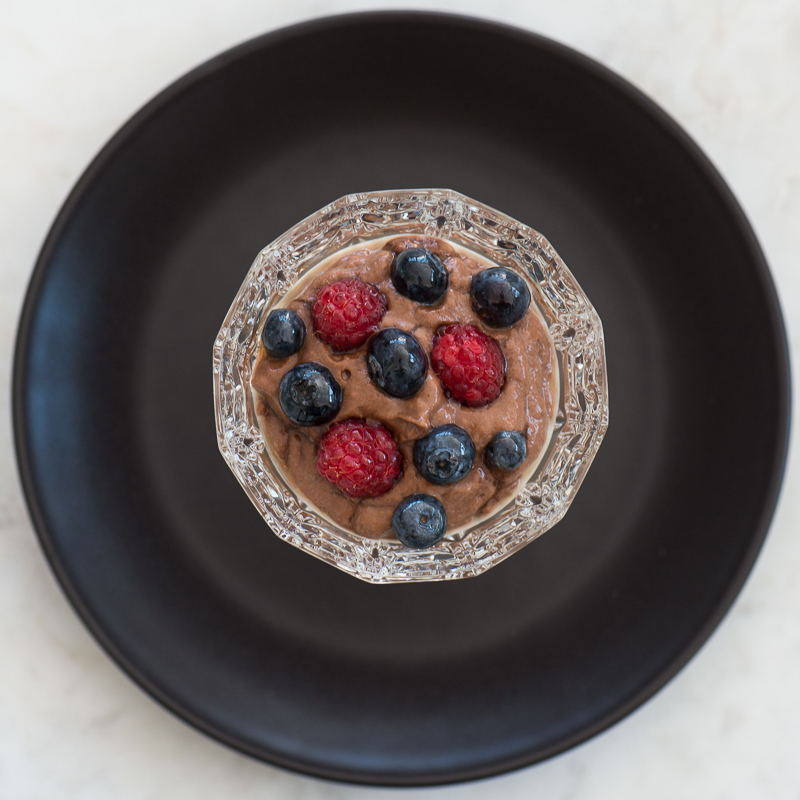 This is a very quick and (almost) healthy recipe for a great chocolate mousse! The creamy avocado provides the thick, fluffy consistency in this mousse. A must try! Also, this recipe is dairy free, vegan and low fodmap (if you eat maximum 1/4 of the whole dessert). 1. Combine all ingredients in a blender and process until smooth and thick. 2. Refrigerate minimum 2 hours before serving. Add some chili flakes to the blender or some crushed licorice candy (gluten free) after the choco mix has been processed. Gluten free living recipes without compromising on style or taste. With a background in nutrition studies, chef school, bakery education and a passion for food and style, we hope to share our knowledge and ideas with anyone who wants to cook gourmet meals without gluten. We hope you will enjoy our blog! Copyright © 2019 The Gluten Free Gourmet All Rights Reserved.